On Monday, the Court of Appeal declined to invalidate Proposition B, the city’s legally dubious 2012 pension reform measure, but it confirmed employees must be compensated for lost benefits. It’s not yet clear how much that will cost. It may take yet another court case to settle the city of San Diego’s messy pension battles. On Monday, the Court of Appeal declined to invalidate Proposition B, the city’s legally dubious 2012 pension reform measure, but it confirmed employees must be compensated for lost benefits. The state Supreme Court last summer ruled that former Mayor Jerry Sanders illegally pushed Prop. B onto the ballot. But courts are weird places, so a measure that illegally became part of the city charter now remains part of the city charter until a court decides that not only did it get there illegally but that it remains there illegally. Those are, perhaps unsurprisingly, two separate legal questions. The Supreme Court ruling sent the measure back to the 4th District Court of Appeal to decide how to sort out the mess. The Municipal Employees Association, the largest union of city employees, hoped a three-judge panel from the 4th District would take Prop. B out of the charter. The justices declined, saying Prop. B is “presumptively valid,” and ruled that another proceeding is needed to test that. That process is known as “quo warranto” and involves the attorney general and another court. “That is frankly what we expected going in and based on oral argument,” said Ann Smith, the union’s attorney. But Smith wants the city and pension reform advocates like April Boling, who is also part of the case, to give up trying to defend Prop. B.
Boling referred questions to her attorney, Ken Lounsbery, who said that Prop. B proponents had yet to settle on their next steps but defended their efforts to uphold the measure. 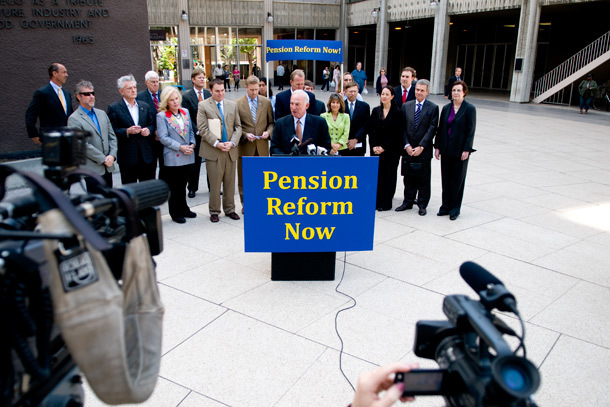 City officials who support the pension reforms were relieved by the court’s decision. Recall that Prop. B was supposed to be the last act of the pension crisis drama that consumed City Hall for a decade. Prop. B, sold to voters as a solution to the city’s financial problems, eliminated guaranteed pensions for most future city employees and replaced them with 401(k)-style retirement programs. The changes did not affect police officers. It became a proud line of legacy on the resumes for conservative elected officials like Sanders, Carl DeMaio, the former city councilman, Faulconer and former City Attorney Jan Goldsmith. The problem was that Sanders, as mayor and the city’s chief labor negotiator, was by law supposed to meet and confer with unions before pushing major changes to their benefits and compensation. That means Prop. B ended up on the ballot illegally, the state Supreme Court ruled last summer. A week ago, the U.S. Supreme Court declined to hear an appeal of that ruling. But much is left to be sorted out, namely how much the city might owe to employees who were illegally put into a potentially less lucrative retirement system. The Court of Appeal tweaked a remedy proposed by the state’s Public Employment Relations Board to make city employees hired after Prop. B’s adoption whole for the benefits they lost following the measure. The board basically said the city should act like the measure never happened. The Court of Appeal found the pension board didn’t have the power to make that call. Instead, the court ruled that the city must pay employees the difference between what they would have gotten under the old system and what they are getting under the new system, plus 7 percent interest. Smith said it’s not yet clear how much that will cost. The court also said the city needs to meet and confer with the unions. Lisa Halverstadt contributed to this report.